First comes love, then comes marriage, then comes BACON in the baby carriage! Why? Because Baby Needs Bacon!! These incredibly cute tee shirts and comfy onesies are a must have for any Bacon loving family! SPRING SALE! 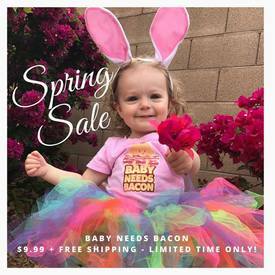 All Baby Needs Bacon Tees & Onesies are only $9.99 with FREE shipping! For a limited time only, offer ends soon!! Pssst....Mother's Day is just around the corner, what a fun gift idea for a Bacon Addict mom-to-be!